​*Additional charges for Photo Ops and Autographs of the Stars. 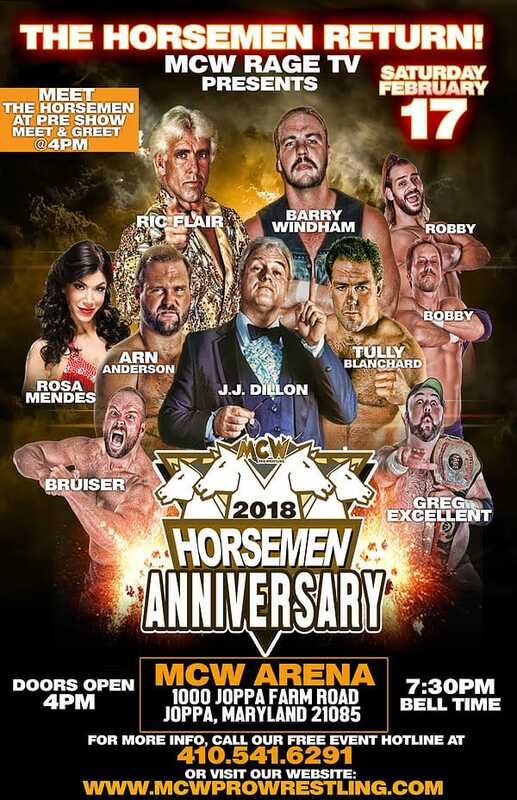 MCW Pro Wrestling presents Anniversary 2018 – The Horsemen Ride Again at the MCW Arena at Joppa Market Place in Joppa, MD. The show will feature WWE Hall of Famer Nature Boy Ric Flair, WWE Hall of Famers The Four Horsemen (Ric Flair, Tully Blanchard, Arn Anderson,Barry Windham, JJ Dillon), Former WWE Diva Rosa Mendes, ROH Star Anthony Henry, The Bruiser and many more. Doors will open at 4:00 PM and meet and greets will start promptly at 4:30 PM. VIP HORSEMEN PACKAGE – $225 – VIP LINE ACCESS (First in line for Autographs and Photo ops), Autographed Show Poster from all 5 members of the Horsemen, One Autograph on your item or an 8×10 we provide (your choice) with all 5 members of the Horsemen and a Photo Op with all 5 members of the Horsemen taken by professional photographer Craig Hunter Ross (limit 2 people per photo op). HORSEMEN COMBO – $150 – One Autograph on your item or an 8×10 we provide (your choice) with all 5 members of the Horsemen and a Photo Op with all 5 members of the Horsemen taken by professional photographer Craig Hunter Ross (limit 2 people per photo op). HORSEMEN PHOTO OP – $100 – One Photo Op with all 5 members of the Horsemen taken by professional photographer Craig Hunter Ross (limit 2 people per photo op). HORSEMEN AUTOGRAPH – $100 – One Autograph on your item or an 8×10 we provide (your choice) with all 5 members of the Horsemen.